Below is a list of some facilities that we have for the equine operation. For more goto the Pictures page. The barn is split into 2 areas. Section 1, has 2 rows opposite each other with 6 stalls each. 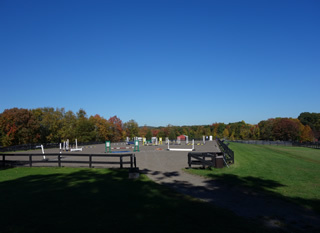 Section 2 contains the wash stall, the laundry room, the feed room, the grooming stall, a secondary grooming area, 3 full size stalls, 1 10ft stall, a bathroom, the tack room, and an office. The heated barn has a straight design keeping it cool in the summer and well lit. 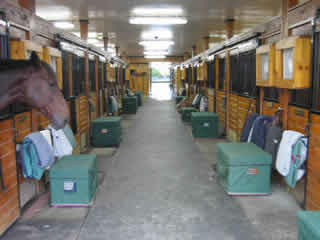 All the 12x12ft stalls have tall ceilings, large windows, automatic waterers with meters, hooks for optional water buckets, cushioned floors with sealed rubber mats, large sliding doors with removable upper gates, large windows, salt block holders, exterior blanket hooks, and water sources at every stall. 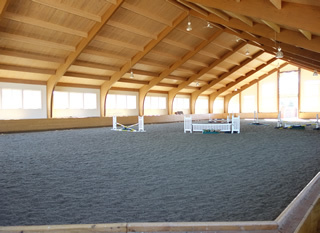 Our indoor riding ring is one of the finest features of our farm. It is a 200ft by 100ft all wood clear span glu-lam building. Besides being absolutely beautiful and a pleasure filled ambiance, horses love the equine footing. Most other barns in the area that use a sand based footing mixed with shredded fibers or rubber and then coated with a wax or oil to make them dust free. Our sand footing is ground and then mixed and melted with plastic. This visco-elastic plastic makes the sand more than just dust free. It cushions and ground and causes the footing to reshape itself like a sponge. We have 2 outdoor riding rings. The first is located adjacent to the barn. At 120ft x 230ft, it is well suited for hunter/jumpers. Because it is subject to the weather, the sand and fiber based footing uses sprinklers to keep this ring dust free. Water allows for better compaction and control. Our other ring is devoted to dressage. At 66ft by 200ft it is ideal size for competition. It is not used for jumping and thus this ring has a harder surface derived from our own blend of natural rounded sands and manmade angular sands with a dust free oil additive.